Celebrate the new season with pretty colors and a bit of glitter. Combine Poppystamps' Grand Egg Die 829, Chrysanthemum Frame G1857 - and blendable ColorBox Lilac, Heliotrope and Pistachio Pigment Inks - to create a delicate garden egg for your spring cards. It's great to have the option of combining coordinating products from Memory Box and Poppystamps. The intricate Valencia Border Die 98290 and a stamped Miracles of Springtime B1766 banner add the finishing touch. I attached a foam dot to add dimension to the center of the banner, a technique I copied from the Impress Facebook page. I could say I was merely "inspired" by that tip - but honestly, I just copied it. Celebrate St. Patrick's Day with some easy diecutting - and a splash of bright Emerald Eyes Glitter. I love how the rich tones of the Violet Notecard and Wildbloom background make the Lucky Leaves Die shamrock sparkle even more. 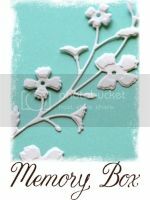 The grassy border is diecut with the new Poppystamps Grassland Border - see the new dies here. It's a must-have for Spring and Easter cards. The Debutante Frame Die created the soft curves along the bottom of the border. Papers and inks in shades of purple, chartreuse and gray - combined with Memory Box's 2012 Viola 6x6, dies and stamps...well, life can't get much better than that in my little color-centric world! Here's another way to mix and and layer some of the 2012 What's in the Box products. I love how Dave designs complementary products to create cards, layouts and mixed media projects that come together quickly. Colors match, diecuts are proportional to each other, stamps and printed papers are easy to coordinate. In a few months, seasonal color changes and new 6x6 papers can easily transform this design into cards for summer or early fall. That's the beauty of Memory Box! Theresa Laurent, Design Editor at Memory Box, and I have sent our Spring class ideas to Impress. I'll post our new schedules as soon as we hear from Carla, who coordinates all of the classes there. Water-coloring, color-pencilling or other skill-required coloring techniques are a bit beyond my reach. Luckily, Dave, Theresa and the other Design Teamers are great at that! Here's another version of my favorite quick, easy and always unpredictable spritzy background technique. Vintage Dreams G1838, Dogwood Branch F1848, Distressed Garden Record G1848 and Wishing You Combo B1853 are the stamps featured here. The delicate accent is cut with the Valencia Border Die 98290. View the 2012 What's in the Box Collection here. Several people have asked about Cuttlebugging with our intricate, detailed dies. I've removed my painters tape spot-shims from the dies and use the Memory Box Metal Adapter Plate instead - without any paper or cardstock shims either. Remember to place the Adapter Plate, die and cardstock behind the printed instructions on the A, B, and C plates - not flush w/ the edge that enters the machine. This allows the stack (others call it a sandwich, but that makes me hungry!) to feed into the machine easily, without using excessive force. Hope you're enjoying our What's in the Box Design Team blitz this week. Visit the Outside the Box Blog and add your comments to each designer's post again tomorrow to enter our contest to win great new Memory Box products. Upload your Memory Box projects to the Memory Box Flickr page too - for another chance to win the new items. Details are on the OTB blog sidebar. I love greens, purples, and grays...and combining them with our newest dies, stamps and notecards. Shown here are Distressed Garden Record G 1848, just a note to say hello B1852, Fuchsia Sprig Die 98303 and Valencia Border Die 98290. The new Metal Adapter Plate was used too - and created these great results with the detailed dies. I didn't even need my painters tape spot-shims!